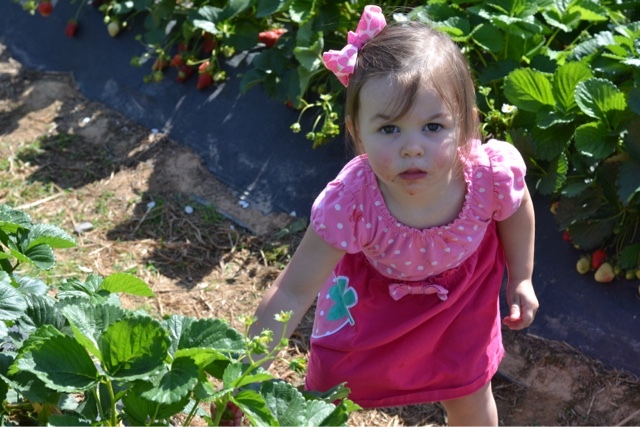 Friday morning, I met a few friends and babies at Hall Family Farm for some strawberry picking! When I was growing up in a small country town outside of Columbia, SC, there was a strawberry patch on the way home from school. 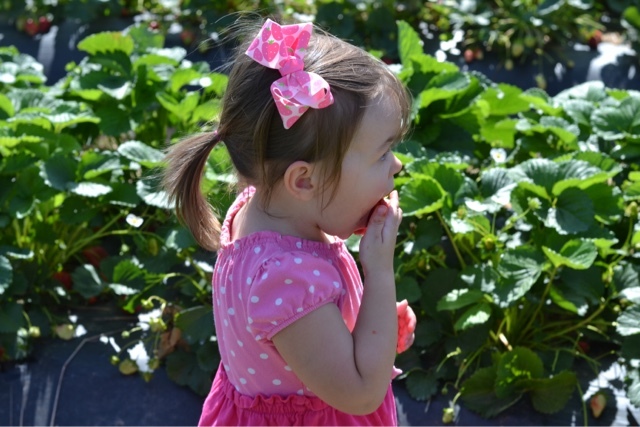 Mom would occasionally let us stop by Mr. Kersey's farm to pick berries (and munch on them, too!). Mr. Kersey used to tell us three sisters to remember that the berries tasted best right off of the plant, and I found myself repeating that lesson to the little girls on Friday. Any local readers -- I would highly recommend this farm! We filled our cardboard basket below about halfway full, bought a small loaf of strawberry sweet bread and a bottle of water, and my total for all of this was less than $10! Good, cheap, wholesome, educational fun. Can't beat it. So, what to do with those beautiful red berries? 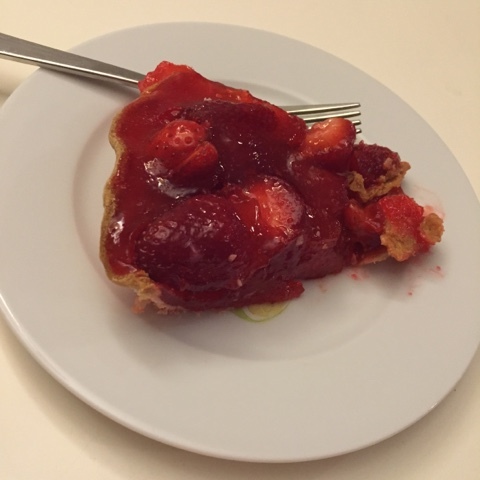 Besides having them on hand for snacking, and slipping a few slices in the overnight French toast that I made Saturday evening, I also put together an amazing strawberry pie. I can't take any credit for the recipe -- I found it here -- but I'll paste it below for ease! Bake pie shell according to package directions. Cool. 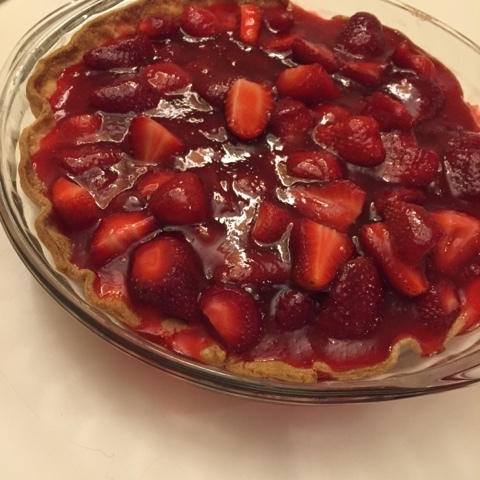 Place washed and hulled strawberries in cool pie shell. Combine water, sugar and cornstarch in a saucepan. Bring to boil and cook two minutes. Add strawberry Jell-O and stir until dissolved. Pour over berries. Chill until set. So, that's it. Easy, fresh, yummy! And, after you've purchased the berries, super inexpensive to make. This would be delicious topped with whipped cream, too. Enjoy, and remember to snag some of those strawberries right off of the plant! So fun! I have never been strawberry picking, but I definitely want to find a farm nearby now! I will definitely be trying out this pie recipe! Have a great day friend! I used to love going strawberry picking in the summer (and the other fruits too!!) Haven't done it in a long time! The pie looks yummy!! Yup - there's a farm similar to this one near us and I am PSYCHED to go! They have a strawberry season and a blueberry season. 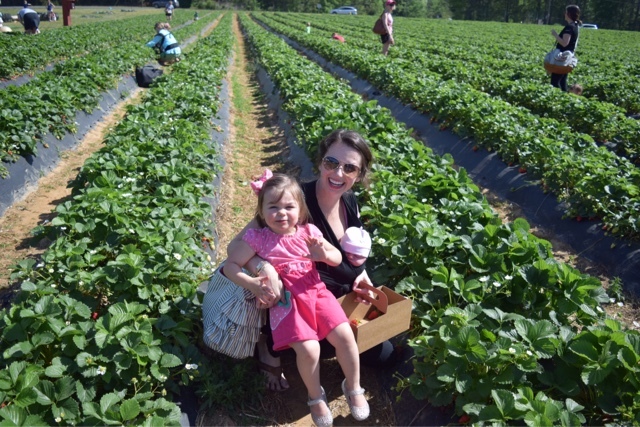 I MISS South Carolina strawberry season so much! I grew up in Fort Mill and used to go to the Peach Stand every year to pick some strawberries - another place to check out near Charlotte! My grandmother has made this exact pie my entire life. 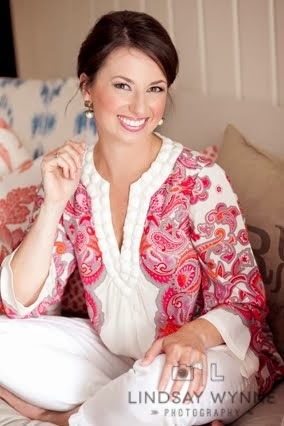 She also makes it with fresh peaches and peach Jell-O! That sounds so good and really easy! We will be going strawberry picking soon, so I'll have to try this! Mmmmm that pie looks delicious! I love strawberries, never thought about adding them in between French toast. Could you please share that overnight version? Thanks. 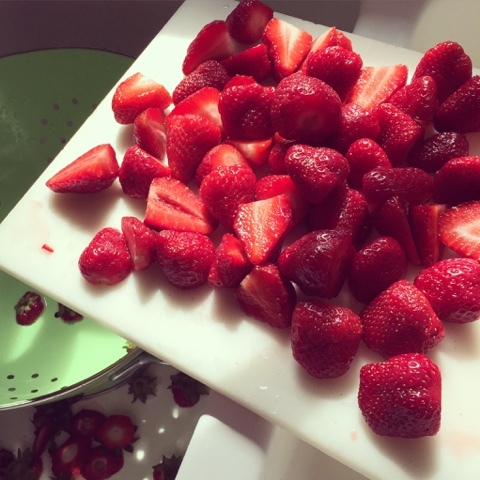 Sooooo we ate all 5 pounds of the strawberries we picked within 24 hours, whoops! Now I need to go back and get more so I can make that pie!!! It looks delicious!!! I can't WAIT to make this strawberry pie!!! Yum, I love strawberry pie & that looks delish! However, I'm interested in this overnight French toast that you spoke of. Yum! Yum! This looks delicious! You should also try strawberry cobbler...we adapt the recipe "Nana's Peach Cobbler" on my blog from time to time and swap out strawberries for the peaches and it is deeeelicious! This looks amazing. I can't wait to try this.